Speakers at an event at the United Nations Human Rights Council in Geneva addressed water resource exploitation, human rights violations and flooding in Gilgit Baltistan, calling on both Pakistan and the international community to take action. 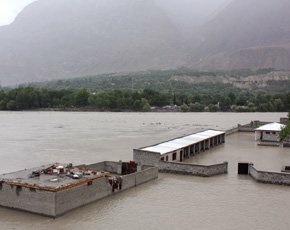 A conference titled "Water Resource Exploitation, Environmental Pollution & Flashfloods in Pakistani Occupied Gilgit-Baltistan" was organized by Gilgit Baltistan National Congress at the United Nations Human Rights Council, Geneva on September 24, 2010. The event was chaired by Senge Hasnan Sering, Director of GBNC. Speakers included Member of the European Parliament and Chairperson of Friends of Gilgit-Baltistan Caucus in EP, Mr. Jurgen Creutzmann; Vice Chairperson of International Kashmir Alliance and Spokesperson for All Parties National Alliance (APNA), Mr. Mumtaz Khan; and President of Gilgit Baltistan National Congress, Mr. Imtiaz Hussain. At the end of the conference, Gilgit-Baltistan National Congress called the press to issue a joint statement. The MEP in his speech asked Pakistan to allocate adequate resources to help the flood victims of Gilgit-Baltistan. He also requested the international community to send relief items directly to Gilgit-Baltistan to optimize its utilization. He asked Pakistani government to improve its environmental record which could help eliminate occurrences of such flashfloods in future. The flashfloods, according to the MEP, has severely impacted economic prosperity and political stability in Pakistan, which is a concern for global community. He said, "It is in the interest of Pakistan's civilian government to reduce environmental degradation. One more flashflood like this could force the military to assume power in Islamabad. Given the risks to democratic institutions, European Parliament must provide financial support to Pakistani rulers only after they guarantee improvement in environmental situation." The MEP feared that extremist elements including the Taliban might benefit from the current situation in gaining sympathy among the poverty stricken flood-victims. He reminded that Pakistan's policy of using Gilgit-Baltistan as a launching pad to advance militancy in Kashmir and Afghanistan enhances insecurities for the natives. The MEP also expressed concern over Pakistan's tactics of exploiting river-water dispute with India to advance militancy in Kashmir. He said, "Pakistan is largely interested in acquiring control over the rivers of Kashmir. Kashmir and water dispute with India have become tools to advance military and strategic interests, which destabilizes the region." The MEP supported the demand of the natives of Gilgit-Baltistan to regain control over their natural resources. He said, "Islamabad exploits resources of Gilgit-Baltistan with impunity. The situation has led to environmental degradation and glacial melting. Pakistan must respect interests of the locals and follow models of sustainable development to eliminate environmental catastrophe." In the end, he ensured continued support to the political parties of Gilgit-Baltistan. Mr. Mumtaz Khan, in his speech, talked about water resource exploitation in Pakistan occupied Kashmir (PoK) and raised concern over Pakistan's plans to inundate the outskirts of Mirpur through Mangla-Mirpur dam expansion project. He criticized Pakistan for incepting organizations like Azad Kashmir Council and Gilgit-Baltistan Council, which denies control over natural resources to the natives of these regions. He condemned Pakistan for denying royalty and usage compensation over Mangla-Mirpur Dam to the people of PoK. Mr. Imtiaz Hussain of GBNC focused on human rights violations in Gilgit-Baltistan, which have occurred due to Pakistani environmental policy. Recent floods and landslides have led to emergence of hundreds of thousands of internally displaced persons (IDPs) in places like Ataabad, Diamer, Baltistan and Ghizer. Further, Pakistan is building dams in Gilgit-Baltistan which will displace hundreds of thousands more and add to the existing number of IDPs. Such a displacement of mammoth scale will disrupt link of natives with their ancestral land leading to loss of national identity. He warned that building dams in a seismic zone like Gilgit-Baltistan will also cause further instability impacting the entire region. The chairman, Senge Hasnan Sering, thanked the audience and the speakers for their valuable input. He concluded by informing about the causes of cloudbursts and flashfloods and how Pakistani military and strategic interventions have become catalyst in worsening the situation. He said, "Thousands of workers, soldiers and para-military with their equipment, explosives and vehicles are present on the soil of Gilgit-Baltistan. Further, several tunnels are being built adjacent to glacial moraines leading to their melting at alarming rate. In addition to environmental degradation, foreign workers compete with natives for jobs and services. In the name of development and infrastructural building, foreigners are encouraged to settle in the region and help change demography. Such policies will only damage the social fabric and add to ethnic violence." The chairperson requested international community to pay attention to issues of Gilgit-Baltistan and PoK and adopt a balanced view on Kashmir.